A war has been raging between vampires and lycans for centuries. Lycans are on the verge of extinction, hunted down by certain vampires known as Death Dealers. The lycans are in pursuit of a particular human named Michael (Scott Speedman), and a vampire Death Dealer named Selene (Kate Beckinsale) is determined to find out why he is so important. "Underworld" is the debut film for director Len Wiseman, who also wrote the movie along with Kevin Grevioux and Danny McBride, but no, not that Danny McBride. 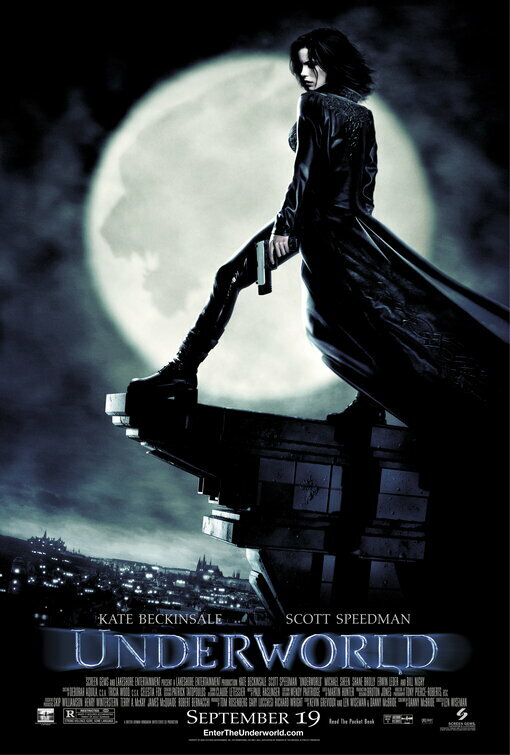 It stars Kate Beckinsale as Selene, a vampire known as a Death Dealer, who specializes in the hunting and killing of lycans, commonly referred to as werewolves. The film opens with Selene and a few other Death Dealers tracking a group of lycans who are in pursuit of a man named Michael, played by Scott Speedman. After a quick battle between the two groups, Michael is able to get away by the skin of his teeth. Selene, however, becomes determined to find out why the lycans are chasing down this particular human. As she starts to research, she begins to uncover a larger conspiracy that could turn her world and all she holds true on its head. "Underworld" is an action horror with a heavy emphasis on the action. It is made up of the style that made other movies, like "The Matrix," popular, full of tight, black leather outfits featuring knee-high boots and flowing trench coats that look really cool when people spin around in slow motion. The film is also entirely washed with a blue/gray overlay to give it a dingy, dark, damp look. The hyper-stylized action found here was a staple of the late 90's and early 2000's. Sometimes it worked, and sometimes it didn't. For "Underworld," it actually works for the most part. Once you accept the premise, this winds up being a fairly fun R-rated action horror movie (back in a time when movie makers weren't afraid of the R-rating) with some fantasy and thriller elements thrown in as well. There is nothing all that profound here beyond some minor historical allegories, but there is a lot of gun play and some pretty cool visuals. Keep in mind, it was the early 2000's, so much of the CGI is extremely noticeable, but considering the technology of the time and the budget of the film, this holds up a lot better than some other movies of the era (read: "The Mummy Returns" from just a few years before this flick). We did, however, find the final showdown and a key creature design to be mostly underwhelming. We can't tell if the final battle is because of Billy Nighy's age, or because it wasn't choreographed well, but either way, it's a pretty big let down. That being said, "Underworld" will probably provide you with a rather fun viewing experience if you let it.